The human sensory experience seems like something that should be notably reliable and yet time after time, society is shown instances where these basic processes, like looking, listening, and even physically touching, are found to be remarkably deceptive. Just think about how much of a debating swarm descended onto the internet with the recent posting of an inconsequential audio clip from vocabulary.com. The human brain is an amazing thing but sometimes its the brain’s potential for complex operations that can lead to confusion at the surface of individual interpretation. One would believe that something as straightforward as counting to a certain number and then starting again from one, ought to be limited in the chance for personal surprise. 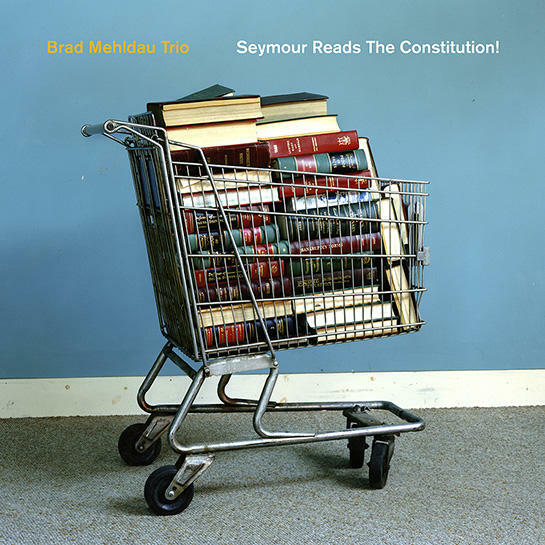 Nonetheless, “Spiral,” the lone single from the Brad Mehldau Trio’s newest album, Seymour Reads the Constitution! (Nonesuch Records, 2018), fosters the perfect storm of elements to present one heck of a rhythmically rousing piece. Take a listen below and see – or rather hear – for yourself. A behemoth of an original composition at over eight and a half minutes long, “Spiral” definitely lives up to its name. Notes wind and rhythm twists the thought of a basic count into a sonically opaque landscape, thanks to the almost absurdly sharp playing skills of these three musicians. Once the piece is underway, Mehldau’s graceful solo piano initiates the tune’s journey toward an inevitably gnarled apex. However, even with the steady, relatively calm, sequential introduction of singular piano, and then easy going snare and hi-hat over longer sustained bass pizzicato only thirty seconds later, just from the mere first notes there’s a chance to fall into the trio’s numerical illusion. Around what time signature – that is to say, what repeated count of beats – is “Spiral” taking the human ear? Some more musically familiar are liable to guess closely or even correctly right away with a response of 5/8. Still, what if a different count, albeit technically inaccurate, still managed to appear correct to the ear even after knowing the designated answer? Start the track over and count to six, tapping out the beat to a signature of 6/8 (1, 2, 3, 4, 5, 6). Suddenly there are two workable time signatures? Not exactly! Despite the fact that Mehldau, whether alone or with his bandmates, is known for meticulous and fastidiously crafted compositions, finding oneself on the receiving end of a musical trick can remain impressive even if its somewhat expected. Ballard’s polyrhythmic injection of hi-hat, kick, and snare start out seeming like they are serving to compete with the piano but still, when counting to six it’s easy to find the downbeats on one and four. What happened to 5/8 though? The reason the odd-rhythm feels like it fades into the background is due to the interplay between the three instruments and what beats each of them separately chooses to give emphasis, whether via more prominent tones, moments of accentuation, or louder dynamics. Back at the beginning of the piece, it’s easy to focus on Mehldau’s separate hand parts and with counting mind, the secret to this trick becomes clear: while the right hand is playing more notes than the left, (and then the reverse during the second phrase) both are changing pitch with longer held notes at the same moments, which happen to fall on an imaginary one and four. The drums seem like they should disrupt this incorrect flow with the percussion playing a completely different rhythm but things are only reinforced when the hi-hat, kick, and bass play more emphasized notes in the same places Mehldau has already solidified for himself. It’s only around 50 seconds in, after a somewhat wet and snappy snare hit outside of the waltzy and sonically mesmerizing loop that counting to six stops feeling either comfortable or sensible because major beats are clashing with the count. Now, even knowing why six can appear to work in rhythm, why doesn’t the proper rhythm of 5/8 standout the most as it should? The method to Mehldau’s madness is brilliant because it involves no change to the notes or to the rhythmic pattern, or even any addition of a basic sonic effect like the sustain pedal. The key is the tempo. The very speed at which the song starts, only increasing as seconds pass, influences where the downbeats feel the strongest. Slow the audio down even just 25% and the odd-time feels more appropriate. Such subtle intricacy, without so much as disassembling the main melody or the increasingly difficult passages that proliferate “Spiral’s” full run time, makes this piece of music applause-worthy completely on its own, to say nothing of the two other original compositions (One being the the second slotted title track and the other being the later listed “Ten Tune,”) the slew of pop and jazz cover tunes, or Frederick Loewe’s “Almost Like Being in Love – Mehldau’s selection from The American Songbook. It would be a disservice though to see “Spiral” as a mere single of sonic cunning, and not also the melodically appreciative work that it is as well. Despite being nimble and at times hard to follow with multiple parts each fighting for cognitive recognition, the trio does manage to establish the sense of a melodic motif that orbits the waltzy twirl of 12 notes that Mehldau played at the very start. The recurs between passages that sound almost improvisatory in-between. Five and a half minutes and beyond, all three parts are loudly heard, supporting chords become dissonant, and things are generally quite hectic when compared with the laid back and break-laden phrases from the first half. That said, even with a less predictable spin on his motif, Mehldau does maintain the sense for that 12 note rhythm even among anxious percussion and a more active bass part. In truth, the quick series of short notes broken up by a briefly longer sustained one, gets passed around the three players throughout the piece. Thus, it’s never fully lost, even when other melodic ideas are being introduced (There’s a clever nod to the main motif of “Vesti la giubba,” the famed aria from Ruggero Leoncavallo’s opera, “Pagliacci;” not to mention application of a similar chord progression throughout. ), or the drums and bass are taking on more adventurous note groupings and faster tempos. Approaching the final minute of play, once things have taken on a frantically expressive character, Mehldau has let loose with the right hand: accidentals, grace notes, blue notes, and turns run quasi-amok but notice briefly that the stabilizing foundation of his beginning pattern almost supervises, unassumingly undertow before all slows down and then stops before the pseudo-6/8 structure form the start reprises its role as a bookend to the finish. At the end of it all, no matter how many twists and turns, the trio never let the spiral spin out of its control. Seymour Reads The Constitution! is out now via Nonesuch Records. Find it through iTunes, Amazon, Rough Trade, and streaming on Spotify and Apple Music.